There’s a line in the story of Jesus’ birth that, since becoming a mother, is always popping into my mind. It’s not one people really stop to pick apart or even contemplate why it’s there. A simple little verse that, written in a day LONG before social media, helps guide my online-sharing practices in this technology age. Just in case anyone needed a visual, I give you Joseph, Mary, and a very excited baby Jesus. A brief synopsis of the story, as well as a couple things we know about Mary: She didn’t come from a well-to-do family. Until of course giving birth to Jesus, she hadn’t done anything notable or newsworthy. She was a teenager, engaged and in love with Joseph, who stuck by her side even when she told him this doozy, “I’m pregnant with God’s baby.” Mary and Joseph travel to their hometown to be counted for a mandatory census. Mary is super pregnant and they must have gotten there kind of late because all the inns and extra rooms are already packed full of people. They finally find an innkeeper who allows them to sleep in his barn with the animals. Baby Jesus is born there and sleeps in a feed trough under the most humble of circumstances. After he’s born, God sends a star to shine over the barn where his family is staying. Angels visit some nearby shepherds to alert them that their Savior is here. The shepherds start rejoicing and spreading the news, waste no time locating Jesus, and bow to worship him as soon as they arrive. Magi (important, well-known wise men) from afar see the star-beacon and follow it to Bethlehem knowing that it’s a big deal. When they make it to the barn, they shower Jesus with expensive, lavish gifts. There is an electricity in the air as the people of Bethlehem start catching on to what’s happening. If this were me in present time, how would I have reacted to all the fuss? Especially as a teenager. The grown men/strangers bowing down to my infant? Document the ordeal in detail to post on Facebook. The visits from three distinguished kings, offering gold and expensive oils? Uh, I’d for sure name drop. Snap a quick pic for Insta of my wee babe in the arms of my famous visitors (with the fancy gifts in view). From being a “nobody” to widespread recognition. Tweet it out and try and develop a following, leaning in to my new-found fame. But what Mary did is the part that sticks with me: “Mary treasured up all these things and pondered them in her heart.” Aware of just how special this child and these moments were, she didn’t rush to a news outlet. She pondered them in her heart. I imagine a little half smile on her face as she gets lost in her thoughts. I know, I know. She didn’t have internet or a cell phone. What would be the olden day equivalent? “She told everyone she met along the road that her kid was kind of a big deal.” Not sure exactly what she would have done if Bethlehem had wifi, but it’s significant to me that this simple line was purposely recorded in the Bible. Moms, there aren’t a lot of accolades or awards in our line of work. We don’t get glowing quarterly reviews or raises affirming us of a job well done. In fact, there are lots of daily complaints and criticisms from our little charges. What Mary teaches me is that the sweetest of these moments with my babies are my most valuable rewards. Meant to be treasured and pondered. I’m not suggesting we boycott social media; my parents who live 700 miles away would never go for that! I’m just encouraging you to keep some things just for yourselves, Moms. Your kids are so special and I know that’s why you want to put it out there, but it doesn’t all have to be broadcast. You deserve to keep something untouched, undiscovered, and sacred that you alone can treasure and ponder. As a kid, I had to wait years – YEARS! – to finally get a living, breathing Christmas present. 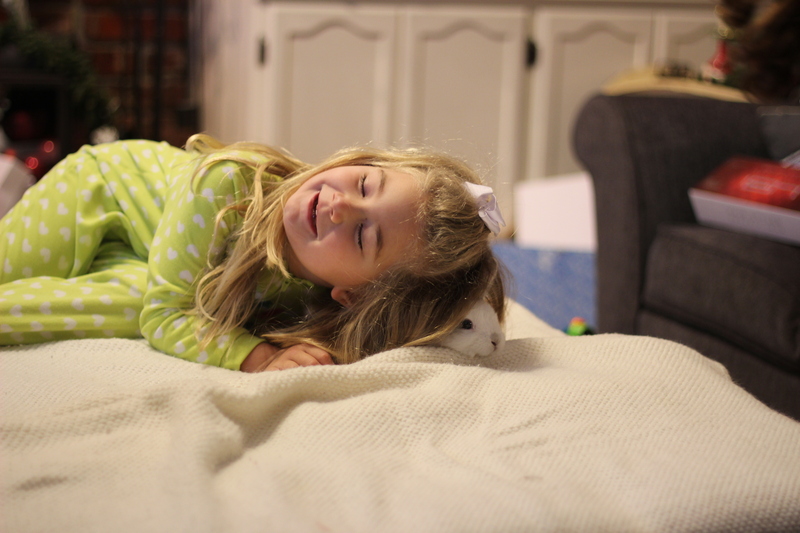 For the last couple months, Harper had her sights set on a horse and, if not a horse, a puppy. And, if not a puppy, a kitty. And, if not a kitty, a giraffe. 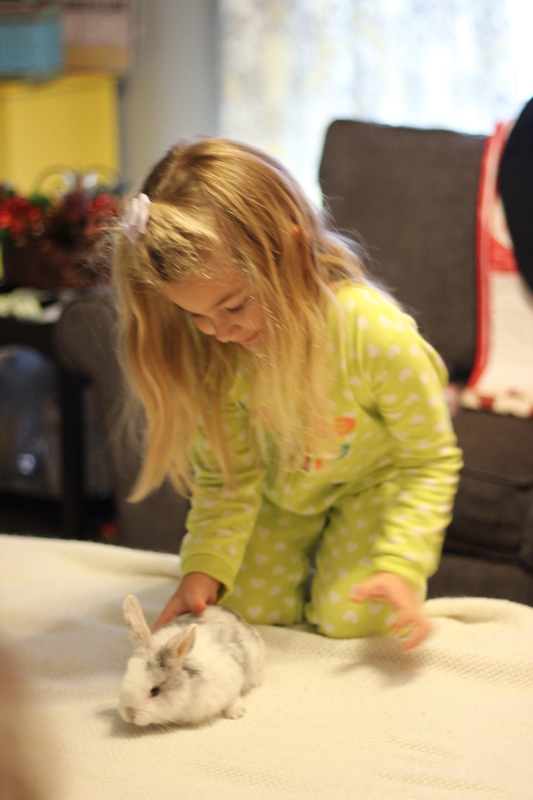 Well, none of those came down the chimney this Christmas, but she did receive something furry, cute, and cuddly. Harper was not disappointed. 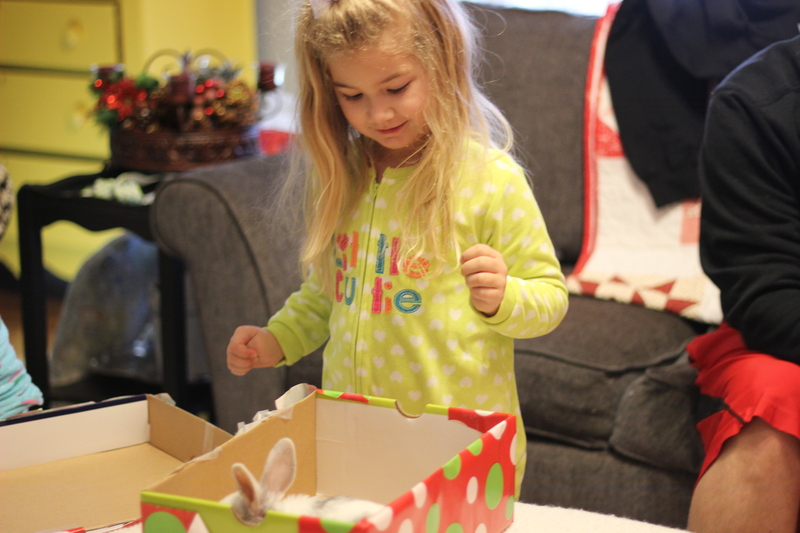 She named her Christmas bunny Frankie; Matt and I wish Frankie the best of luck at our house. 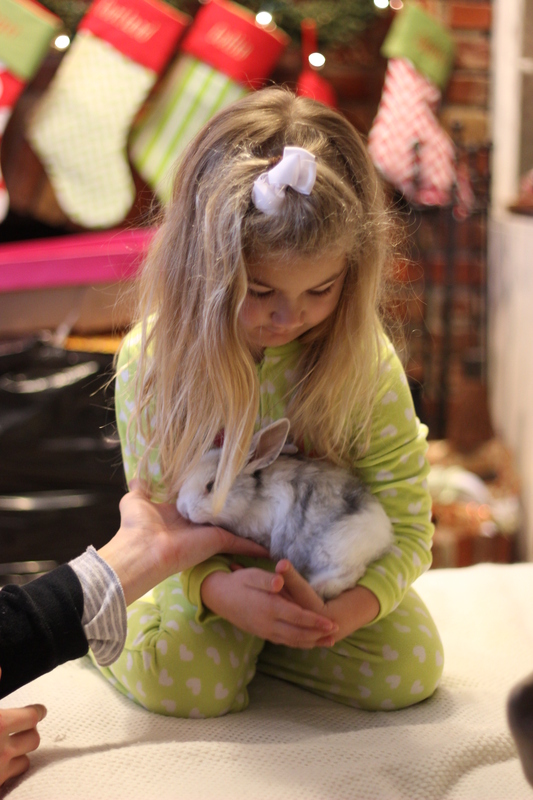 We don’t have a great track record with fish, but I’m assuming rabbits are more durable…one thing I know, he will be loved! Finally getting a pet that can be snuggled. 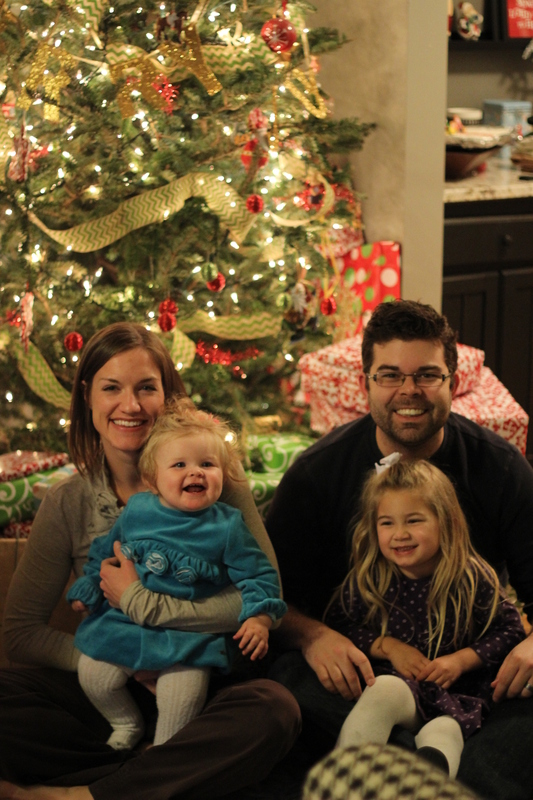 Merry Christmas from the Moss family!